Mike Hutson, one of our regular guests, swears by surface lures for Smallmouth Bass. He’ll be the first one to tell you that topwater fishing for Bass is wild stuff, especially in the clear water at Kay Lake. “The excitement of the surface strike keeps me coming back every year,” Mike told us. The tough thing is figuring out what lures picky fish will hit. To give you some ideas, check out Game & Fish Mag’s list of 9 Topwater Lures For Summertime Smallmouths. Oh – one more thing! 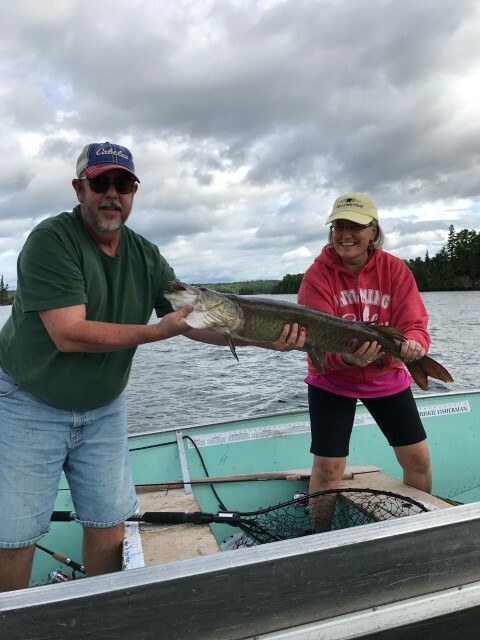 Mike brought up his wife Nancy, who had never fished in her life. 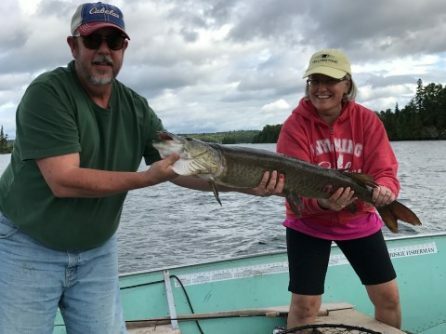 Her very first cast, she landed a 14″ Bass and a 36″ Muskie. The Muskie took the Bass and Mike got ’em both in the net!